Let's face it. A wedding is not entirely about the bride, even though the emphasis is usually the bride and her dress. The groom is pretty important too! 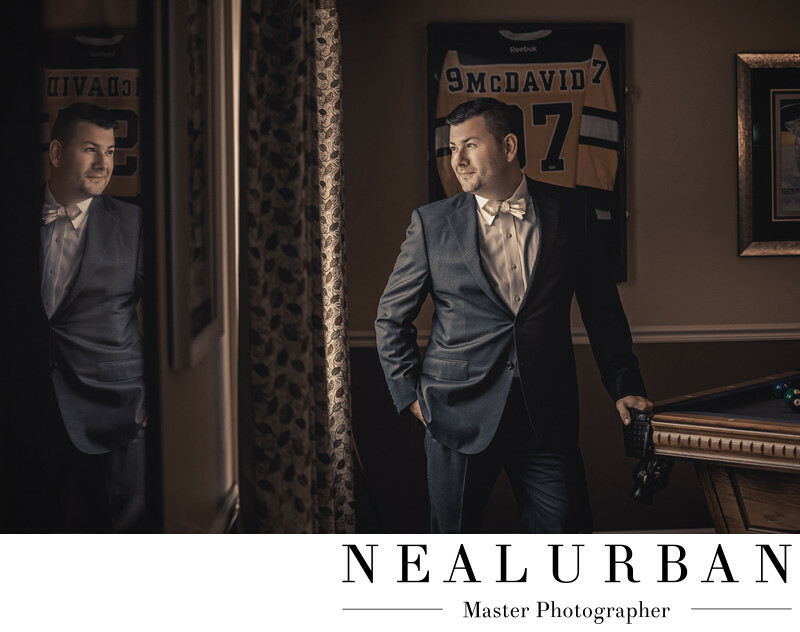 We always make sure to get some great portraits of the groom and his groomsmen. Just take Ben here! He is GQ all the way. Ben was getting ready about 5 minutes from where his lovely fiance Julie was getting ready. Neal snuck over to grab some portraits and I hung back with Julie and her bridesmaids. You can tell by the jersey behind Ben and the edge of the pool table he is leaning on, this was in his man cave! This was Ben's comfort zone and also a great location for his solo portraits. Most grooms (or just guys in general) are not big fans of having their photo taken. Ben was a natural and loved the camera. He is super casual in this photo. Nice and simple with his hand in his pocket looking off over his shoulder. He has the the most manly and serious smirk in this photo. He pulled off that look really good! For some added fun, there was a mirror on the wall. We love reflections. If we can find one, we are using it for an image. You can create some really fun and unique photos with reflections. This was a great way to start the wedding day off. It continued the entire day with the reception being at Shea's Performing Arts Center! Location: 646 Main St, Buffalo, NY 14202.